Clear out your bookmarks. You're going to need the space for 50 offerings that are indispensable to navigating, enjoying yourself, shopping or just killing time on the Web. "Press one for English." 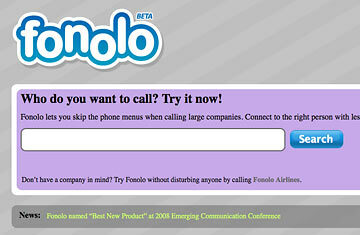 Here's a better idea: use Fonolo. It makes the call to that large, impersonal corporation, presses the right buttons and stays on hold for you until a human comes on the line. Then your phone rings and voilà, you can talk to a live person about your account. Fonolo even gives you the option to record your conversation as an MP3, just in case your chat with customer support becomes an argument. Is this for real? Totally! How does it know what you want it to accomplish? Fonolo shows you a visual map of the phone trees of various big companies and allows you to pick your point of entry. A computer does the rest. See the 50 best inventions of 2008.